Acupuncture is defined as "the insertion of needle into the body for the purpose of therapy, disease prevention or maintenance of health". 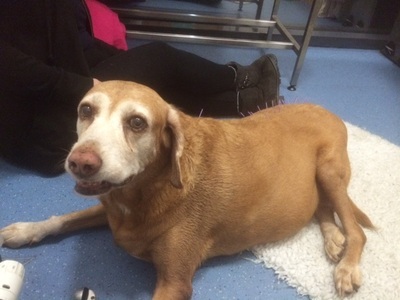 Acupuncture is classed as an act of veterinary surgery and so only registered veterinary surgeons are allowed to perform acupuncture on animals. If you are not a client of Animal Tails, your pet needs to be referred for by your own vet for any treatments. 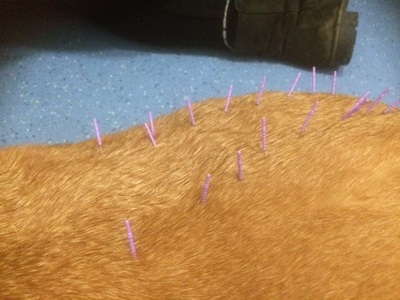 Many insurance policies will cover acupuncture fees when it is recommended by your vet. Check your policy to see if your pet is covered. At Animal Tails Helen practices the Western Scientific Approach, as apposed to the Traditional Chinese Medicine Approach. This gives her the freedom to insert very fine, single-use, sterile needles anywhere on an animal's body where 'trigger points' have formed providing it is anatomically safe to do so. Some animals will respond quickly with a dramatic and quick improvement in their condition and in some the change will be more subtle. Your pet will be examined thoroughly before any needling takes place. Treatments usually take around 15- 30 minutes but vary from patient to patient as some are more responsive to needling than others. Initial course is usually 3-4 treatments once or twice weekly and then given as required. 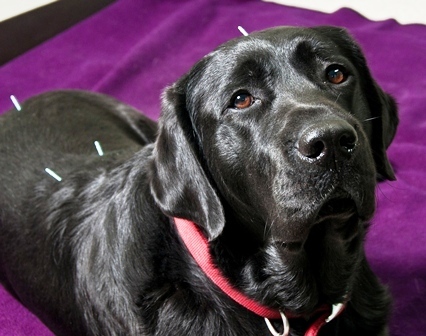 Most animals tolerate acupuncture very well and some even get sleepy during the procedure. A small proportion of animals are extremely sensitive and their symptoms may appear to worsen after treatment. This is only transient and can be prevented by shorter follow up treatments. Following acupuncture most patients are more playful and appear happier and more youthful.